Karnataka's middle order gradually closed the door on Uttar Pradesh's campaign on the final day of the Ranji Trophy league phase, in front of a capacity holiday crowd in Shimoga. Ganesh Satish and Stuart Binny surged to career-best efforts in contrasting styles, but missed out on well-deserved double-centuries, while Amit Verma chipped in with a sparkling ton. The draw meant Karnataka slipped behind Mumbai to second place in Group A. The day yielded a whopping 403 for 3, obscuring just how menacing RP Singh and Bhuvneshwar Kumar were in the first hour of play. Twice in his first over, Bhuvneshwar snapped length balls onto Satish's pads - the first off an inside edge, and the next when the batsman was well forward. The batsmen were edgy, and a couple of risky singles followed, but UP missed the stumps. RP had Verma groping tentatively outside off stump before bending one in to hit the pads when the batsman was forward. RP bustled in with energy from round the stumps, and was soon up with his team-mates in a raucous caught-behind appeal. It wasn't clear if Satish had edged it, but UP kept imploring even after it was ruled not-out, prompting the umpires to have a word with them. Soon after, Satish survived a thick edge that skimmed over the slips, and Verma fended a pacy Bhuvneshwar bumper without conviction to fine-leg. Ten overs into play, the ball was replaced after being deemed out of shape, and UP couldn't sustain their intensity with the replacement. Suresh Raina's opening gambit had failed, and the pressure dissipated rapidly once his best bowlers were taken out of the attack. Verma took Karnataka past 200 with a flick off Imtiyaz Ahmed, before whipping Suresh Raina's first ball of the day to the midwicket boundary. Verma proceeded to toy around with the spinners, dispatching Raina on either side of the pitch, and hacking Piyush Chawla behind square for boundaries. He couldn't beat his captain to the century though; Satish pushed his 217th ball towards point and was punching the air in joy even as he completed his first hundred of the season. Raina turned to the second new ball in desperation, but Verma wiped off some of the shine with two glorious thumps through covers to roar along to his seventh first-class ton - his second 50 runs coming off just 52 balls. He attempted the shot again two balls later, but edged RP behind, with the lead at a far from imposing 141. Reinvigorated by the breach, RP probed away with intent once again. Satish was pegged back in the crease by a sharp bouncer, before being coaxed into edging a full ball that landed just short of the slips, and slashing a short ball over the cordon. 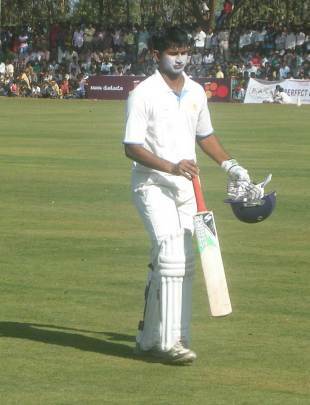 Karnataka's best batsman of the season then unfurled the best innings of the day to kill UP's spirit. Binny seemed to have an answer for everything UP threw at him. When RP made Satish look vulnerable at one end, Binny rattled boundaries at will from the other. When Bhuvneshwar pitched it up, he slammed him through the covers; When Imtiyaz slipped it in short of a length, he guided him behind point. With lunch looming around the corner, he plundered Imtiyaz for four successive boundaries. UP would have known then that the game was up. Thereafter, it became an exercise in meticulous accumulation for Satish, and free-spirited indulgence for Binny. As in the first innings, Binny tucked into Chawla's hapless lengths, repeatedly shredding him through the off side, before hoisting inside out into the press box. Binny also slammed him straight down the ground for another six, and reverse-swept him for a boundary. Withered by the assault, UP's shoulders slumped, their lengths slackened and their fielders fell back. Satish nudged it around to move towards a double-century, but fell ten short. Binny almost inevitably purred along to his third century of the season, and managed to up the tempo even further, to reach 150 off 136 balls. The game meandered into the mandatory overs as Binny took a tilt at his double-century, but the pointlessness of the exercise did not quell the cheer of the 4000-odd spectators who had trooped in.